time. These customised trucks can move up to 250-tons; this enables them to transport wind turbines, for example. The amount of work involved in customizing a truck is enormous, as the vehicle has to be fitted with stronger frames, additional axles, highly efficient cooling systems, a special clutch to help get the truck moving, and a high-performance braking system. And these are only the most important conversion tasks. A stationary presentation held at the Mercedes-Benz plant in Worth. Mercedes-Benz Trucks is displaying an Actros SLT with comfortable air-suspension for road use as well as an Arocs SLT with a robust parabolic spring for tough assignments in extreme terrain. 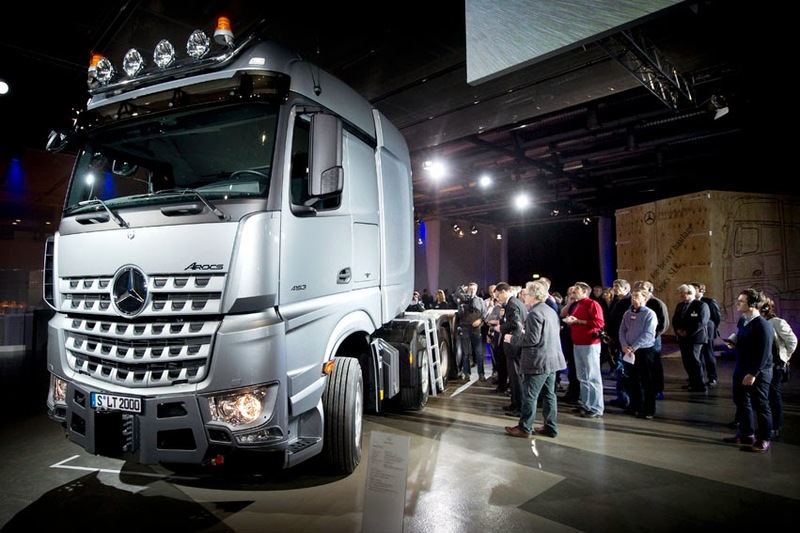 Production of the trucks began in December 2013 at the Mercedes-Benz plant in Molsheim, France, which serves as the base of Custom Tailored Trucks (CTT). The plant fulfills even the most unusual wishes of truck customers from all over the world. "Such oversized loads are almost unsurpassed in their complexity," said Stefan Buchner, Head of Mercedes-Benz Trucks. "We're putting the most powerful and robust Mercedes-Benz trucks of all time on the road to perform the shipping industry's toughest jobs. The SLT is tailored to these requirements, down to the last detail." The three or four-axle tractors feature Euro-VI technology and are powered by the new OM 473 six-cylinder inline engine with 15.6-liters of displacement and 460 kw/625 hp of output. The maximum torque is 3,000 nm. The 16-speed PowerShift transmission, which is found in no other heavy-duty tractor, enables finely coordinated shifting. The retarder and the engine brake have a combined braking power of 720 kw (979 hp). And that doesn't even include the power of the normal service brake. "On average, CTT converts around 20 per cent of all of the trucks produced in Worth. The relocation of truck customising to Molsheim has greatly reduced the complexity of operations in Worth, thus increasing our efficiency. At the same time, CTT's high level of expertise guarantees that vehicles will receive unique, custom-fitted solutions. Molsheim's motto is - We never say 'it can't be done'. Our employees at the plant fulfill even the most demanding customer wishes," said Yaris Pursun, Head of the Worth truck plant and of Mercedes-Benz Special Trucks.